In most contexts, the words killer and ballerina don’t often go together. One word produces images of violence and bloodshed, while the other is consistent with beauty and grace. In the situation of Franceska Mann, these two words are now synonymous with the same person. To have these two words coexist in such a way does not often make sense, but when placed within the context of war, it changes everything. The name Franceska Mann is not one you read in the history books or often hear about. 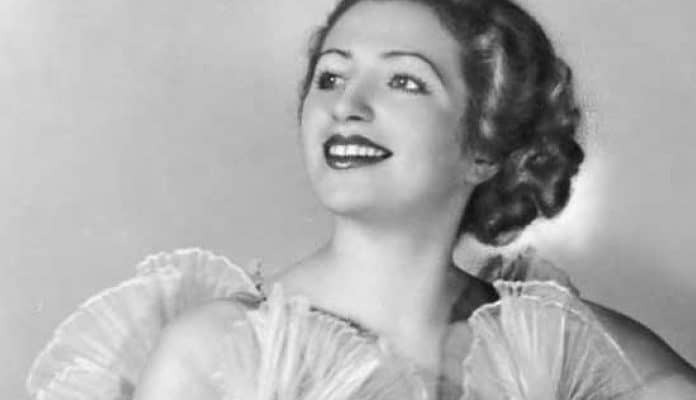 A dancer from Poland during World War II, little did she know she was destined for so much more.Up until 1939, she lead a fairly privileged life compared to many of her fellow Poles, attending dance school and participating in dance competitions that made her one of the premier dancers of her day. All of that changed when war came to her doorstep and changed her life forever. Hitler and Nazi Germany invaded Poland in September of 1939. This action would begin what we now know today as World War II, but at the time not many saw the long-standing ramifications that would leave millions dead and Europe on the brink of collapse. At the time, 22-year-old Franceska was a dancer and performer at the Melody Palace Night club, and was well-known in her country. Though she held pretty high status in her community, it could not save her from the fact that she was Jewish. It was not until a year into the Nazi occupation that she was forced to live in what we now know as the Warsaw Ghetto. She was one 400,000 Jews who were imprisoned in the Polish capital city so that the Germans could watch them more closely. The living conditions were terrible and it is believed that thousands died due to the unsanitary conditions and lack of food. What many did not know initially was that this was basically the holding pen for the first rounds of Jews to be sent to the Nazi “work” camps for elimination. Once placed into the Warsaw Ghetto, Franceska’s story begins to blur due to the chaos of her life at the time. It is clear that there were began to be many resistance movements within the ghetto, but it is unclear whether she was involved in those at all. People began to try to escape their prison instead of resisting directly and it is believed Franceska is one of them. Due to her lighter complexion she and others managed to hide for a time in the Aryan quarter of the city. Franceska managed to stay relatively hidden during this time and elude the Nazis that were shipping her people off to Treblinka. This was one of the many sites that the Jews were told were “work camps”. It was only later revealed that this concentration camp in particular was used only for the systematic extermination of the Jews sent there. There was no attempt to even create the illusion that is was for work purposes as had been previously stated to the people. Those who were sent there were literally transported there just to die. It did not take long for people to figure out what was going on. During this time rumors began to float around about a possible way to freedom. There were whispers of ways to escape the ghetto by making connections at a place called the Hotel Polski. It was at this hotel that promises of freedom and escape evaporated for many Jews who were striving to take back their lives. By 1941, the Jews that were imprisoned in the Warsaw Ghetto were searching for a way out of the horrible situation that they were in. There were many theories going around as to the best way to escape, but many of them led the Jews to the Hotel Polski. It was believed that by gaining entrance at this hotel, that you could pay to have paperwork produced that would guarantee you passage into neutral parts of the world such as South America. One of the most popular theories is that the Allied forces had been in negotiations with the Germans and both groups had come to some sort of trade arrangement. Essentially, they would trade the Jews in the ghetto for captured German POW’s. The Jews could obtain the needed paperwork at the hotel and then they would be organized for transfer. Of course people then began making arrangements to secure their documentation, but unfortunately not all was as it seemed. As it turns out, this whole “trade agreement” was one of the great conspiracies of the war. It is now widely believed to be a plot by the Nazi’s to lure out Jews who had gone into hiding. There are some accounts that say this whole plot started out as a legitimate agreement with noble intentions, but was hijacked by the Nazis and used to capture Jews instead. What makes this worse is that there are also accusations against Franceska, suggesting that she betrayed her own people in order to receive paperwork that would free her. There is also another theory surrounding this event, and it all revolved around the almighty dollar. There are some who say that the operation being run out of the hotel was at least kind of legitimate, but was really set up to get money from the richer Jewish population. The Nazis were allegedly allowing the Jews with the money to buy their “freedom” for an extremely high price. One of those who was rumored to be able to afford this was Franceska, and she became a connection between the Nazis and the richer Jewish population in order to get them to freedom too. Whatever the truth actually is about the roots of the Hotel Polski Affair, there is one thing that is clear: People were given a false sense of hope that they could procure their freedom in some way by going this route. Some are believed to have made it to out of Poland and to South America. Most did not find that restoration of freedom that they were seeking, but instead were led to a horrible fate, no matter how much money they had or status they held. Franceska Mann was not exempt from this either, as she too joined 1700 of her fellow Jews on a passenger train that would lead them to their deaths. On October 23, 1943, a train pulls into the station at Auschwitz – Birkenau, carrying souls that fully believe that they are on their way to a new life. Though the train has stopped, no one really panics because they are told that this was the last stop before they cross the border into Switzerland, and from there they will go on to South America. Little did they know this was the end of the last trip that most of them would ever take. What happened next is based upon actual eye-witness accounts of some of the prisoners at Auschwitz, including Jerzey Tabau, whose testimony was documented at the Nuremberg Trials. According to Tabau,the passengers were unloaded from the trains and told they were being taken to the showers to be disinfected before being allowed to cross the border. The women were then sent towards the “showers”, which were actually gas chambers. It was at this point that they were ordered to undress, and some of the women began to feel that all was not as it seemed. As some of the SS men noticed some of the women hesitating to follow instructions, and some versions say that things got a bit chaotic with the guards starting to hit the women and force the rest to undress. Franceska takes the opportunity to diffuse the situation by using her dancing talent to distract the guards. She seduced them by stripping down to nothing but her high-heeled shoes, and enticed them to come closer to her. One officer took her up on that, and that is when all hell broke loose. Franceska is said to have then removed one of her high-heeled shoes, and smashed it into the face of an SS officer named Schillinger. Once she hit him, she was able to grab his pistol from his waistband. Franceska then fires the gun twice at Schillinger, and then one more at his comrade SS officer Emmerich. The other women were inspired by her actions and began to attack the guards as well, so fiercely in fact that it is said one guard had his nose ripped off and another had his scalp nearly torn from his head. As this scene unfolded, more SS guards arrived to put an immediate stop to this uprising. They of course had the advantage of both numbers and weaponry so when assistance arrived the women really had no chance. Many were killed by machine gun fire and those who weren’t were either put in the gas chambers, or taken outside and executed. Though the women had resisted, the forces they faced were just too overwhelming. What was the fate of our beautiful, gun wielding dancer? There are conflicting accounts as to how she met her end. Some say she was shot with many of the other women upon the arrival of reinforcements, while others claim that she took her own life with the pistol that she used to kill one of her captors. No matter how Franceska met her fate, one thing is made clear: she was brave, determined, and unwilling to surrender. It is true that the world lost a gorgeous and talented young woman that day at Auschwitz, along with many other innocent people. Though it is heartbreaking, the legacy she leaves behind is one of beauty, persistence, and above all, courage in the face of hate and tyranny.